As work begins today, here they are. The yellow tracing paper covers that portion of the piece not yet worked on and protects it from smears or dirt. 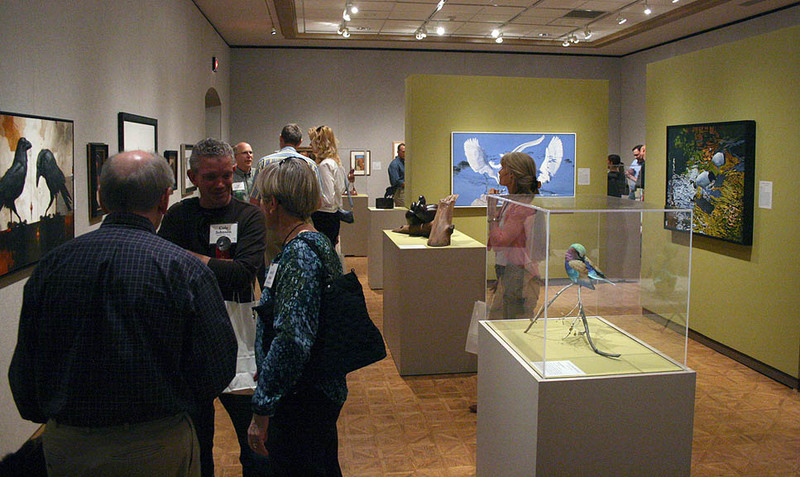 The Woodson Art Museum posted some great shots from the opening weekend of Birds in Art on their web site and I wanted to tag a couple here. First, the 63 exhibiting artists of the 118 included in this year's exhibition, who were able to attend the opening weekend. Can you spot me? Next are a couple of shots of just some of the 90 plus postcards donated by exhibiting artists for the museum's 2010 Post Card Project which raised funds for museum purchases for addition to the permanent collection. As I noted in an earlier posting here, the museum had asked for artists to do these little 4 x 6 sized works to offer at $25 a pop. Many of us sent in two or more of these and it was gratifying to find that all sold! I even managed to get one before they were all grabbed up. It is one of the little works shown in this first image. And, I'll just add that both of my small works are also shown in this first image. Can you spot them? Some mighty fine little gems here! A horse is a horse, of course, of course, and no one can talk to a horse, of course . 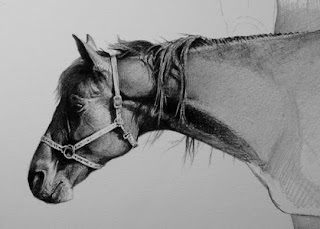 . .
A new work begun on the drawing board yesterday. As this week, with its last few days of September gets underway, I read with joy this morning, of last night's opening of the 31st Annual International Marine Art Exhibition at the Maritime Gallery at Mystic Seaport. My work, On the Point, garnered, for the second year in a row and for the sixth time over the last couple of decades, the Marine Environmental Wildlife Award. I thank the judges and am most honored to have had my work singled out among those of many other fine works in the exhibition, for this award. And, best of all, the work was one of 15 pieces that sold at the opening! Not a bad way to begin a work week. With my head still a bit cluttered from my recent bout with the flu, I was able to sit at the drawing board yesterday for the needed hour or so to complete this piece that has been leering at me, begging to be finished, for the last couple of weeks. Titled Night Light, it is most likely headed to inventory for the upcoming Waterfowl Festival on the eastern shore of Maryland in mid November. It's 6 1/2" square. What's next? Hmm, good question! Being an artist is a tough job. Like any other self-employed individual, you have to make your own way in the world. There isn't a time clock to punch in or out on and you don't collect a paycheck at the end of every other week. Being an artist can take more courage than most think it might. It 'costs' a lot in blood, sweat and tears to stand before a blank canvas, piece of paper or clay block and attempt to translate into either two dimensions or three, what resides in your heart and soul. I have often equated the feeling of accomplishment and gratification that I receive when I finish a work that I am particularly happy with as like pulling little pieces of flesh off; it leaves a scar as a reminder of the effort that went into producing that work, a reminder that part of me went into that work and will always remain a part of that work. Being an artist, for most, is not a choice. We may know from the very beginning what our path in life is to be, or it may take time, years of meandering along other pathways before we get to that all important, inevitable fork in the road that demands we finally resolve to be who we are meant to be, or not. Being an artist throws down challenges to us, challenges that can make us better at what we do and help put focus on the best use possible of whatever talents we have. The ability to produce a work of art that can spark an emotional response or connection within someone else is not something that comes easy to many. When it is achieved though, that creative and emotional outpouring of the artist's inner being is celebrated by both artist and collector alike. Being an artist means, also, having the strength and stamina to withstand the 'slings and arrows of outrageous fortune' that are thrown our way each and every day and to not allow any of it to distract from being explorative and digging ever deeper into our creative depths. An artist reader commented the other day on her dismay at not having her graphite works, done on paper, given the respect that is generally lauded upon works on canvas. I feel her pain as long, long ago, the realization became quite clear to me that many professionals in the 'business' of selling art and many collectors as well, will not even consider a work done on paper, be it a drawing or even a watercolor. 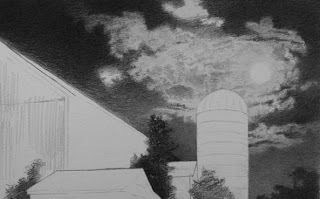 When I first turned professional as an artist twenty years ago, this nagged at me as I had not really chosen the medium of graphite as my means of letting the creative juices flow, the medium had chosen me. 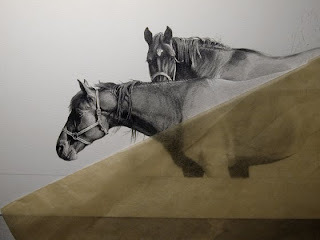 As my technical use of the medium developed then, from all the previous years of honing and refining and testing papers and such, I knew that working in graphite on a piece of paper was what I was meant to do and that was that. My joy in rising every morning to spend a productive day in the studio was rich with ideas and plans and purpose and it all revolved around using that monochrome medium. I have talked here before about having been a painter when younger and in art school and a bit thereafter, but never feeling the fulfillment that I immediately felt once I started intently working in pencil. For years, I had forced myself to try and get command of paint mediums and to produce work that I was proud to put my name on. This never really happened and it always was a frustrating experience and, ultimately, led me to abandon any sort of creative art making at all. I spent years sitting at a drawing table, making the same straight lines and marks on architectural drawings in one office after another, paying bills, having a life, getting along. And that was just it, I was simply getting along! The turning point finally came, that inevitable fork in the road, that point at which I had to make some decisions about the way the rest of my life might go and my path was set. Returning from the first of seven eventual trips to Africa, I picked up a pencil and 'dabbled' a bit. At first, the 'sketches' were memories for me, memories of that incredible continent that I fell in love with and the change in course that my life seemed to shift to after that experience. Long story short, twenty years after those first steps on African soil, came the day I became a professional artist, not looking back on failed moments on canvas, not looking back on months and years spent in other pursuits, not looking back at all but looking forward to each new day as a professional artist. I could finally tap into every creative atom that I knew I had inside me. One should not start down a road like that making any assumptions, good or ill, and I just began to do what I do, learning as I went, discovering how far I could push myself, testing and always feeling a level of accomplishment that was beginning to be accepted out there in the big, cold world just as many other artist had done for generations. With my medium having already been established for me, the main focus of my subject matter also seemed predetermined in a similar manner as Africa and its animals and the experiences of my recent trips there, were always at the forefront of my ideas for works of art. Finding very well established venues and exhibition situations that were structured solely for the depiction of animals and nature, I found immediate outlets to hang my work and through participation in these group ventures over the years, I made new contacts and found even more acceptance for my work. Now, all through this time, the early years after turning professional, it was very apparent to me that since my medium and major focus of subject matter was rather limited in scope, I knew there was going to be a limited 'market' and approval for it. This was something I just had to accept and move on from. It was not something I took lightly, but in the end, finding an increasing number of eyes that were drawn to my work, made it easier. Whether I was lucky or in the right places at the right times or whatever, I was gratified to find collectors who were interested enough in my work, work on paper, to be able to pay the bills and have a life and get along just as I had when working in all those architectural offices, but with much more joy to it all. First, do what makes you happy - first! There seems to be little point in working in the studio on things that don't challenge you, make the best use of your creative talents or bring a smile to your own face. No matter what the medium or support, be it paper or canvas, your inner soul should dictate to you and your best work should surface. Second, hone your skills with whatever medium has chosen you. Learn from others whose work you respect and who work in the same medium. Art school is always a great place to learn basics, but to really, truly learn how to use a medium, find someone who you respect and pick their brain. Third, don't let the 'slings and arrows' get to you. Find outlets and venues and exhibition situations in which your art, your chosen medium will shine. 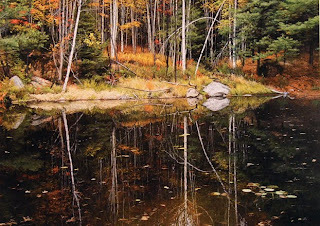 Do your homework and discover juried events in which you can stick a foot in the water. 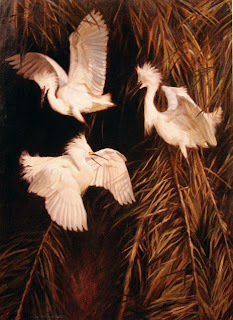 For me personally, it was such as Birds in Art, which I have just posted about in these last few postings. There are lots of possibilities out there for getting your work accepted and respected and to have a work or two juried into these sorts of major events, shows that much needed spotlight onto your work and you. The Internet has become, just as with other issues, a tremendous source of information and possibilities for finding all sorts of competitions and contests. Fourth, depending upon your subject matter, find organizations or art groups that focus solely on that subject matter. For someone like me, who works with animals and nature subject matter, such groups as The Society of Animal Artists can be a wealth of information and opportunity to a 'newcomer' artist or even one who has been around for a bit. Acceptance and membership to such organizations gives an extra added cache to your work as something beyond the norm, in most cases. Having your works equated with that of more well known or Master artists in the field, can only serve to elevate it and give you even more goals to set for yourself and your art. In closing, it has always occurred to me, in relation to art works on paper and their lack of acceptance as important works by many, would these same persons turn their noses away from a drawing by Rembrandt or Matisse, Picasso or Degas, Van Gogh, Escher or Leonardo? I certainly do not equate my work with the likes of those masters and would say basically, 'to each his own'. Those that would find pleasure in a work on paper and wish to add it to their collection are those who I endeavor to make connections with. If in the course of time, others who may never have considered it before, join those that have found such pleasure, connection and emotion in my work, great! There are enough possibilities out there, I feel, for all who have an appreciation for a fine, well balanced, inviting work of art to be able to select from and a work, just because it is on paper, should not be relegated to a secondary status or ill considered if it embodies the best of those same elements. What can be the best of all possible ways to enjoy the days following a wonderful art opening? You may well ask. Not, I would contend, the way that I have been 'enjoying' the last five days, flat on my back most of the time, in bed with a flu-like thing. Arrgh! Well, all 'good things' have to end and so this too is finally ending. Sitting here in my PJs and robe, still feeling like I was hit in the head with a baseball bat, I have managed to sit to the computer today and catch up on email and such, go through the last four days of snail mail (more on that below) but . . . won't be setting foot in the studio for at least another day or two. I just can't keep my head straight, yet. So, the current work on the board, with little more than an hour or two of work left on it, will languish a bit longer, but not too much as heavy deadlines are afoot. It is, after all, the last week of September and I have things to do, places to go, people to see . . . well, things to do at the very least! And now to that snail mail . . . notice arrived in one of the last few deliveries that my work, Puttin' On the Ritz, included in this year's Birds in Art, will be going on a year long tour along with 59 other works from the 118 piece inaugural show at the Woodson Art Museum. I am thrilled, needless to say, that in all but two of the 19 years that I have been involved in this marvelous exhibition, my works have been selected for the tour. When the hanging at the Woodson ends on November 14th, the works for the tour will be packed up and shipped off to Port Arthur, Texas and a January 16 - March 13, 2011 hanging at the Museum of the Gulf Coast. Lucky Texas! Next stop on the tour will be Hastings-on-Hudson at the Newington Cropsey Foundation from April 4 through June 9 of next year, followed by a journey northeastward to the Wendell Gilley Museum in Southwest Harbor, Maine for a July 1 - October 9 hanging. The final destination for the four venue tour will be the Michelson Museum of Art, another Texas venue in Marshall, from October 29th through January 8 of 2012. Long tour, but to some very fine venues and available to a huge number of new eyes. If you are close to any of these locations, mark your calendar to make certain you are able to take in some wonderful art. As a sort of addendum to yesterday's post, I wanted to focus some thoughts today, not on the art work, not on the individual artists, but on the place in which it all happens. When I first was made aware of the exhibition, Birds in Art, almost twenty years ago, I had no idea of what was being talked about. At that point, I had been a professional artist for little over a year and was still finding my feet very wet and the back of my ears very pink as I tentatively made my way around in the wildlife art field that had become my chosen means of making a living. Encouraged to submit a recently completed work which had birds as a subject matter for jury consideration for this, unknown to me, exhibition, I rather reluctantly sent in my slide and jury fee and thought little more about it. The assumption at that time was that this neophyte graphite artist would have a snowball's chance in . . . well you know where . . . of getting through the jury. When the, as we all used to refer to it, BIG envelope arrived in the mail in mid May of 1991, I was astounded at my good fortune. It was then that thoughts turned to those who were encouraging me to physically go to the opening weekend of the exhibition, that I really began to panic. What could possibly make me believe that I had any right to be present for such a thing? Long story short, I went, I saw, I did not conquer but I did realize rather rapidly just how important an event Birds in Art was. And the other thing that stood out about the three day whirl wind that the opening weekend became, was just how wonderfully warm and welcoming everyone at the Woodson Art Museum was. Over and above being surrounded by some of the most fantastic art and artists in the genre of wildlife art, I was blown away by the sincerity of the people of Wausau in their desire to make all of us feel like family, even someone like me who was a 'first-timer'. And there you have it . . . one of the reasons that year after year, the competition for jury into Birds in Art becomes a major goal for so many artists all across the globe, not just those whose main focus is generally wildlife subject matter, but fine and respected artists in many other genres. 'It's the place, stupid!' you could say. It's the place indeed. It is hard to find new and more descriptive words to talk about the feeling that overtakes, experiencing being a part of the opening of Birds in Art. I have been reading on various artist's blogs and facebook postings over this last week, their reactions to the festive events of last weekend; reading their heartfelt words of appreciation for all that is done for the artists and the feelings that we all come away with on Sunday morning as we board our various flights to head home that we are leaving friends, family and people of such good sort that we can't wait to come back. In all my years of being a professional artist and even before then, and in all the grand art events and gallery 'dos' that I have been privileged to have been a part of, I have never had the feeling that so strongly inhabits me the minute I step foot into the Woodson Art Museum. Those people just know how to make an old friend feel rewelcomed and a new, first-timer feel as cared about and appreciated as those of us who have been honored to be a part of it all for many, many years. Maybe it is something in the water, maybe it is something in the good old Midwestern ethic of welcoming a new neighbor, maybe it is something more personal? Whatever it is, that sincere ability to make someone feel extra special is a treasured commodity for sure and one that hardly exists any more in these days of 'me, me, me'. I have commented here and in other places across the years that I always stand in amazement upon departure from Wausau at this time of year, at the seemingly effortless way in which the weekend flies by. And even when a slight ripple occurs during the three days of opening events that might otherwise create difficulty in another venue or location, all seems to even out within seconds and the fun just flows on in Wausau. Cheers, Woodson Art Museum! Cheers, people of central Wisconsin! Cheers, to my peers who made the cut this time around! And Cheers to all of us who now begin the daunting task of thinking about wonderful, imaginative, appealing, and unique works of art for jury consideration in a few short months, so that we may all experience, once again, that very special feeling. As promised the other day, we're about to embark on a mini tour through this year's Birds in Art exhibition, the 35th anniversary edition of this world-wide reputed, juried competition. 118 works, both two and three dimensional, were included in this year's hanging and I have selected 32 of those works to spotlight and to act as fine examples of what I have often talked about on these pages when asked quite specifically for my thoughts on what I feel dictates a good, well put together work for jury consideration. 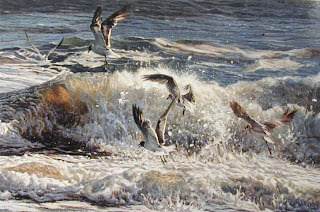 Birds in Art, being one of the premier annual juried animal art competitions, is always a good place to focus each fall. I am pleased that I was able to attend the opening weekend this year as I missed being able to go last September and it is always a treat to see, in person, the fabulous work that makes the cut. Viewing images on catalog pages is acceptable to get a fair understanding of a work, but when you cannot juxtapose sizes and see actual colors and brush strokes, the true essence of a work is diminished somewhat, in my opinion. Though I have only pulled out less than one third of the works included in the exhibition, I feel that they all embody some of the best qualities of the kinds of works that I always talk about in describing what I feel are works that invariably will catch a juror's eye and beg to be included in the final cut. This is not to, in any way, diminish the intensity and wonderful compositional structures of the other 86 works not featured here. I could have easily spoken on each and every work of art included in this year's exhibition, but for the sake of time, the chosen 32 do represent, I feel. the overall high level of artistic and creative endeavors of each of this year's represented artists. Many of these works were done by artists who were fortunate enough to have their work juried into Birds in Art for the first time this year and that also speaks volumes about the creative energies that overflow here. 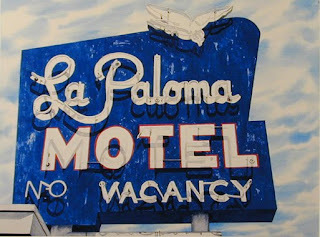 After being included in this internationally recognized exhibition in 19 of the last 20 years, it never ceases to amaze me, the levels to which every single artist goes to create works that encompass a range of ideas, ways of communicating those ideas and unique viewpoints when dealing with such a thematic competition. 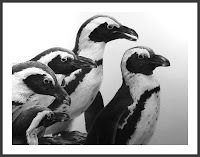 As you will see in the examples here, there are many ways to take a simple subject, like birds, and develop very diverse and exciting compositions. Long time readers of these pages will know that I find the development of a compositional idea to be one of the most challenging and interesting, thought provoking parts of being an artist. I've spoken at length about what I feel are the important concepts in putting together a composition that will set that work of art apart from all others when viewed in a continuous stream of slides or digital projections in a jury room. Sometimes it's a touch of humor, sometimes a different gestural movement. The unexpected will always stop someone and beg that they dig deeper and become more involved in a work of art; hidden treasures and the hunt for them can always spark interest and become an important way in which a work of art can rise above others. Masterful rendering always allows the cream to rise to the top and that combined with a slight twist or unique viewpoint or odd thrust of light and shadow will enhance a technically well done work and move it to that next, higher level. So, with all this in mind, a look at the first set of works that certainly reached out and grabbed me as I walked the galleries this past weekend. In this first grouping of four works, I refer to that time-tested means of forming a well balanced and interesting composition, the rule of thirds. I have talked about this format many times over the five years of posting to this blog page, but I cannot speak strongly enough of just how foolproof making use of this compositional device is. 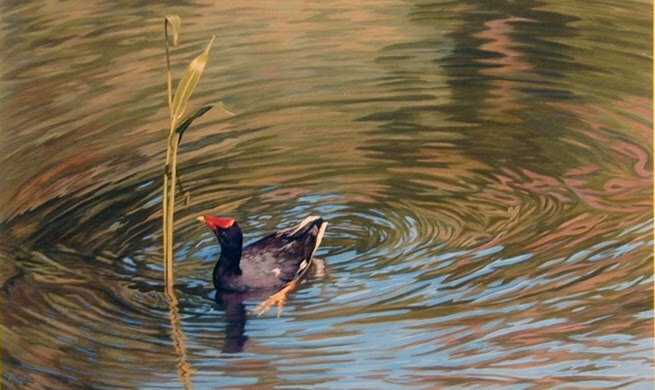 In the image above, Arlene Rheinish of California has developed a beautiful rendering of a Hawaiian moorhen. It's a simple and spare oil with the focus being on the bird with the artist's elegant rendering of the water swirls acting as a soft, almost invisible background. 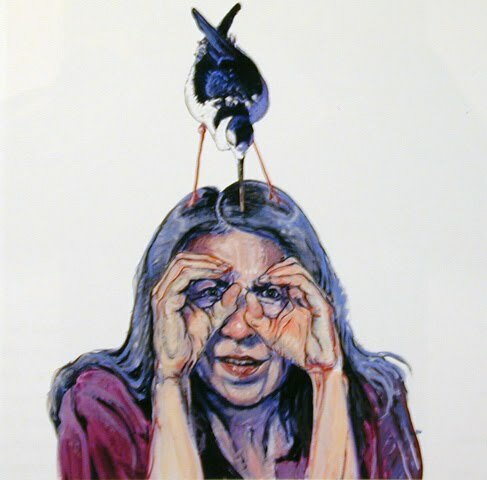 The work's intensity is further heightened by her minimal use of color, allowing the bird to become the full focus of the work leaving distracting elements out and only incorporating the single stem that the bird is focused upon as a strike point for the viewer's eye to be drawn into the work. The bird is positioned almost precisely on one of the four 'sweet spots' determined by the rule of thirds and therefore offers a more interesting placement than it would have if, say, the artist had positioned the bird more central to the overall dimensions of her canvas. In the first of the two works shown above, Sueellen Ross of Seattle, has taken a compositional format that I love to use, a long horizontal work area, and painted a wonderful, inviting work spotlighting a rather common and often maligned bird, the grackle. 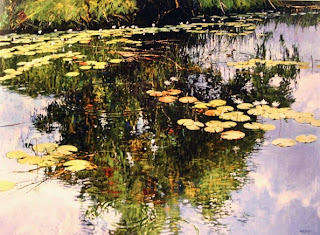 Her use of a large area of 'negative space', indicating sky, offers more intensity to the bird and the other elements of the composition, namely the beautiful ruffle of the leaves across the bottom of the image. There is not a lot going on in this work, but through her deft use of all that negative space and the wonderful jumble of leaves, which add a nice bit of movement to an otherwise static pose, along with a very spare palette, this rather simple depiction of a rather uninteresting bird becomes a very unique and appealing work of art. Again, the bird sits pretty much on one of those most important sweet spots. 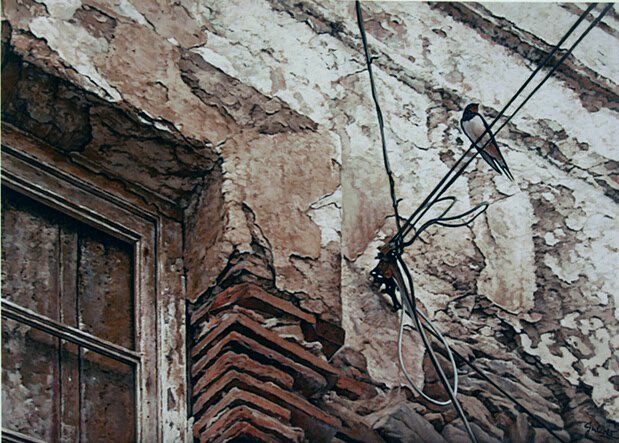 In Joe Garcia's beautiful watercolor of a mourning dove sitting on a fence, we see again, a rather spare composition, though incorporating more elements than in Sueellen's work, the same sort of positive and negative spatial relationships are present here. 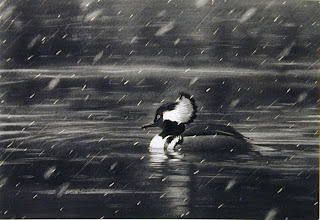 There is a nice diagonal sweep to the work which naturally brings the viewer's eye to the point of focus, the bird. Also, the finely detailed interweaving of the fence, which in some ways duplicates the movement of Sueellen's wavy leaves, adds a nice touch of movement to an, again, rather static pose. The introduction to the left, of the signage, from which Joe took his title for the work, American Fence Co., adds a nice bit of balance to the right facing bird. 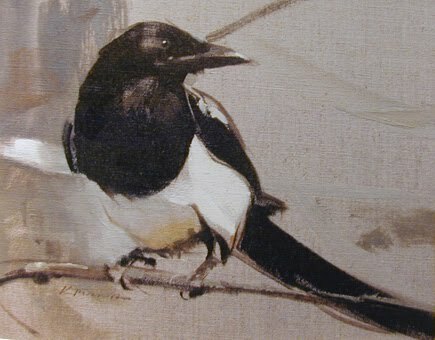 If that little bit of dark and heaviness were not there to the left, and considering the position and gestural movement of the bird looking over its shoulder and off to the right margin, there is the possibility that the work would have lost balance, pulling the viewer's eye off the right margin and out of the painting. As in Sueellen's work, the bird sits at just about the vertical break of the third division across the horizontal plain of the canvas. 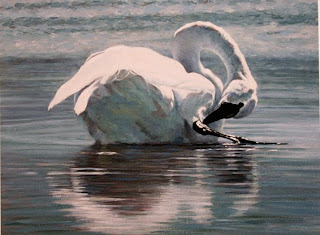 In the last of these first four works, below, Anne Shingleton, a first time inclusion in B in A, has painted a beautiful oil portrait of a mute swan. 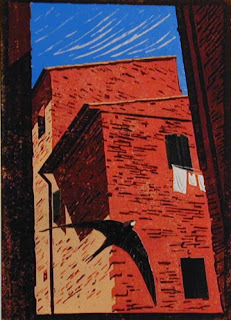 Residing currently in Florence, Italy, Anne's work really stopped me cold as I was immediately drawn into the composition and its unique viewpoint, interesting patterns and lovely use of light and shadow. 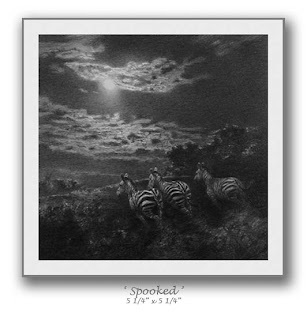 Incorporating a bit more in the way of compositional elements than the two works just mentioned, this work still has a very spare feel to it and relates back to Arlene Rheinish's work in its almost monochrome water tones. Looking at this work and Arlene's, you can see how the large expanse of water acts as an almost nonexistent, subtle foil for the major subject matter of the work. 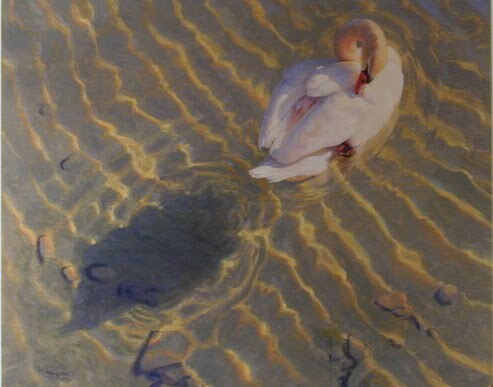 Anne's inclusion of the beautifully rendered shadow of the swimming swan adds a nice balance to her very intentional positioning of the bird, again sitting right on one of the four important cross points of the rule of thirds. The addition of the angled ripples in the water, adding nice diagonal interest, not only gives a bit more indication of movement throughout the work, but counteracts the thrust of the bird's movement left to right. They and the shadow act in the same way that Joe Garcia's signage did to create a nice balance across the entire work area. 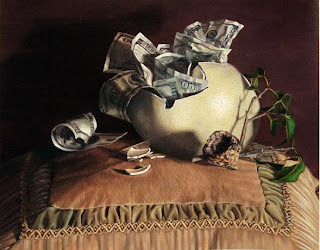 In this wonderful oil painting above, by Cincinnati resident, Leslie Shiels, humor reigns. 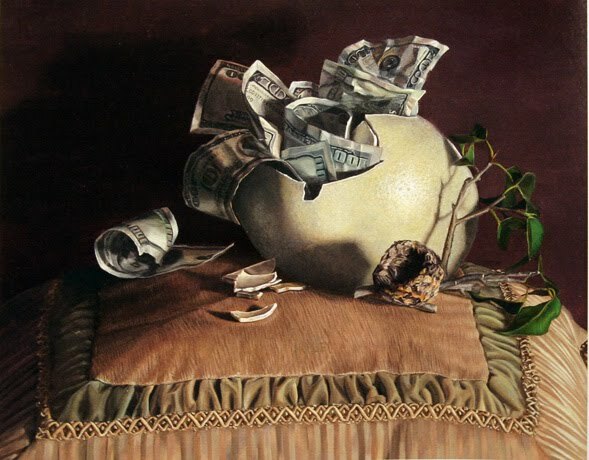 As I have often said, adding a humorous twist to a work can often make what might be an otherwise overlooked or less considered work, more appealing to both a viewer's eye as well as a juror's eye. Working in a 3 foot square canvas format, Leslie has given us a nice laugh, as well as made very fine compositional use of the square field in her triangular composition structure. Bernd Poppelmann, a ten time inclusion in B in A from Germany, works within an almost square format as well, developing a fine rendering of a red-crowned crane in oil. As in several of the already discussed works, his canvas is spare, a lot of negative space surrounds the subject and allows the bird to take on the important thrust that it's movements signify. 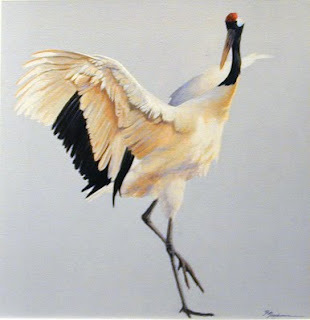 It is a simple painting, the bird's coloration being very monochrome again with that wonderful red crown adding just enough intensity to this otherwise soft work, but the way in which Bernd chose to portray the bird, in action, is the thing that captures my eye. There is a sharp, abstract, graphic quality to this very figurative work that also intrigues me as a viewer and I have no doubt, did the same for the jury. A painting very much after my own heart, Martin Lasack's Wren, depicting a Bewick's wren, really spoke to me as a fellow artist. His composition focusing in on the twists and turns and textural details of the tree is every bit the sort of idea that gets my juices flowing when thinking in terms of interesting compositional ideas. 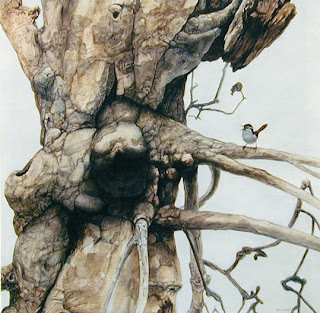 There is much here to see, but his deft placement of the bird against a large area of negative space gives the small creature the impact and intensity needed to pull the viewer into the work and make it recognized as a piece of bird art, though the importance of the work is totally built upon the mass and sharp detail of the tree. This is the sort of idea I often mean when I talk about the unexpected, the surprise, the 'ah ha' moment in a work of art; the very things that I think become appealing to a juror's eye when reviewing a huge number of art works. He has devised a very interesting, engaging composition within that square boundary that can sometimes be a hard place to work within. They say, and I don't know who 'they' ever are but . . . good things come in small packages. I do believe there is truth to that and the next five artists have figured out a very strong way in which to make their little gems have as much impact as larger, more involved works of art. My understanding of the jury process at the Woodson for Birds in Art indicates that the jury does not have knowledge of the sizes of works that are being considered, only medium and title. If this is indeed the case, then a small 9 x 12 painting has just as much possibility of being considered in the final cut as a 36 x 48. The job though, of the artist, is to make a strong statement in order to capture that juror's eye. In the first little gem below, Californian, Gloria Chadwick, does this, to my way of thinking, in spades. 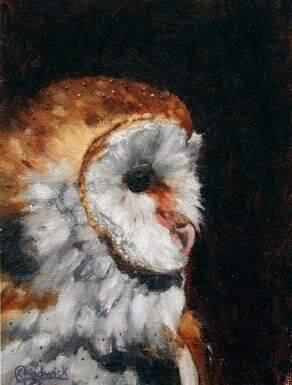 Her tiny 8 x 6 oil captures the soft beauty of a barn owl. A rather straight forward portrait , she has heightened its intensity through placing the bird on a solid background, giving the nicely lit feathering of the owl strength belying the softness of the individual elements. Her brushwork also caught my eye immediately allowing at once both a feeling of impressionism and 'quick study' like mastery, alongside a feeling of detail and immediate understanding of her subject. By doing the bird in profile, I also feel she has given this simple work a feel of mystery - what is that owl looking at, what is it concentrating on - and these sorts of feelings are always the sorts of feelings that will draw me into a work of art. First-timer, Kathryn Mapes Turner of Jackson, Wyoming, has also brushed a beautiful small scale work with her black-billed magpie, December Magpie. This work, 11 x 14 in size, carries through, for me, the same sort of instantaneous, quick study feel of Chadwick's work above. There is again, a spare inconsequential background, nothing to detract from the masterful rendering of the bird, its shape and feathers taking center stage. The magpie's natural coloration leaves little for sharp differentiation, but she has managed to infuse this very appealing work with movement, intensity and again, a feeling of mystery as to what has caught this bird's attention? In these next works, first by Lindsay Scott of New Zealand, and second by Virginian, Mary Cornish, these fine painters have developed two lovely little portraits focusing on intimate moments, capturing unique gestural movement in their respective subjects. 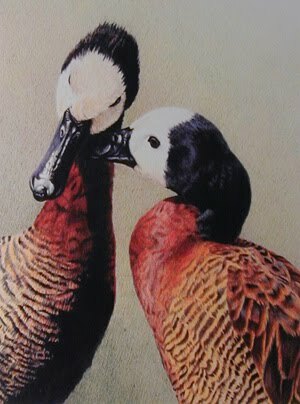 Lindsay's 12 x 9 colored pencil rendering shows white-faced whistling ducks and is aptly titled, Intimate Moment. It is at once a very soft and sensitive rendering of this pair, yet also a very strong depiction, heightening its strength through deep coloration and detail work in the feathers. By focusing in on the heads and upper bodies of the two, the intimacy involved becomes such a strong point of focus, it is easy to see why this little work made the final cut. In the case of Mary's Picasso's Muse, again there is an intimate moment of preening with this lovely depiction of a saddle-billed stork in her 16 x 8 oil. Negative background pulls focus totally to the bird and its interesting gesture with its beak. An unusual pose, the strength of this work, I feel, lays in the stark contrasts between dark and light and red features. There is little room for guesswork here as anatomy of naturalness of the bird need to be foremost in this close-in view. And finally in this little grouping of gems, one of my personal favorite works in this year's exhibition and one that appeared to be overlooked by many of the public attending the various opening weekend events, German, Ron Meier's linocut on paper, Summer, knocked my socks off. 11 x just shy of 8 inches, this little work really spoke to me and begged to be delved into. I can understand completely how this gem was one of the jury's favorites and made the final cut. The intensity of color, the wonderful line quality, the perfect balance of compositional elements, the whimsy of it just rang all the bells and whistles for me. 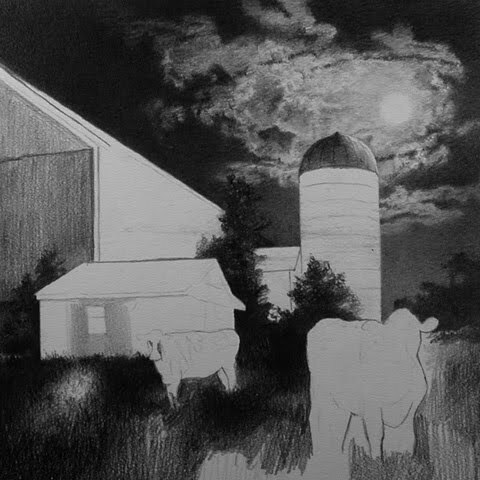 Being a monochromatic artist, working in graphite, I am always anxious to see what other monochrome works the jury might have selected. I was not disappointed this year. 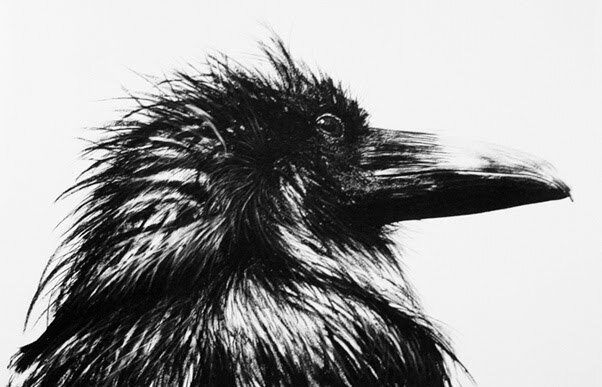 First, Michigan artist, Karen Bondarchuk, blew me away with her 33 x 42 charcoal raven portrait. It's size alone was a first draw for me and then, upon a few minutes of observation, I was struck by an underlying sense of humor in the work. As in several of the other already discussed works, a strong sense of immediacy in this work was reflected in the way in which Bondarchuk produced sweeping lines and movement in the work. Being much larger than life size, a true depiction of anatomical correctness was needed and quite easily carried through. 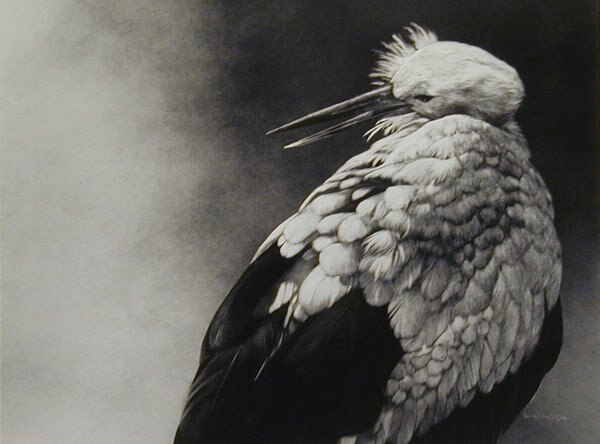 And below her raven, fellow Maryland artist, Paula Waterman's beautiful scratchboard of a European white stork, took my breath away as well. In Paula's work, it is the light that always is the strongest component of her compositional possibilities and this work had it all around. In addition to the detail of the feathers, the light and shadow modeling of the bird, the intimate gesture of a waking bird, her placement of the bird, off center, looking right to left, balances the negative space of the background perfectly. 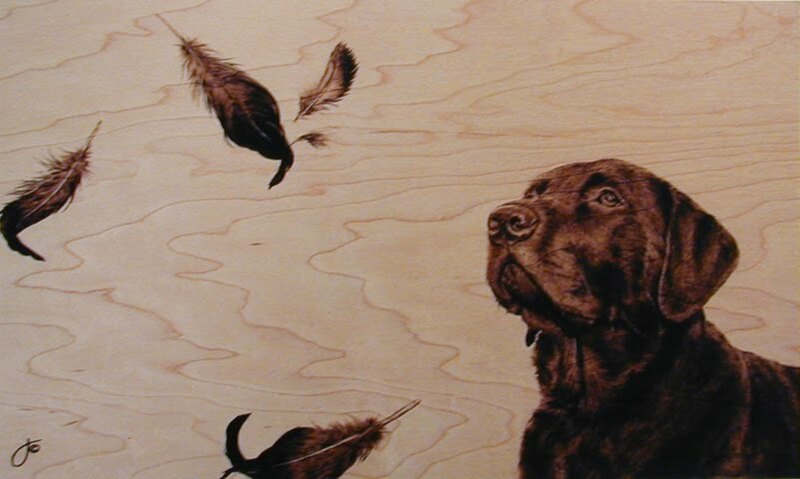 Two fellow graphite artists come next, first Cole Johnson of New York State and his hooded merganser, followed by Ryan Jacque of Massachusetts and his little sparrow. In Cole's work, he has masterfully given the viewer a very accurate depiction of the bird and it is indeed, a beautiful portrait. What makes this piece special to me, and I would believe the jury as well, is the addition of the indication of snow falling. As Cole even noted in his text accompaniment to the work in the catalog, he felt that without the addition of the snow and its lovely soft movement in the work, the work would have seemed 'a bit dull'. 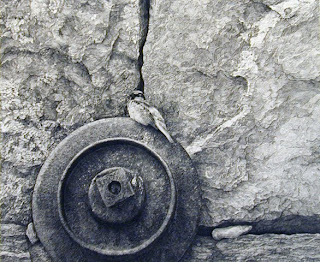 In Ryan's texturally intricate and revealing work, Stonemill and Sparrow, he gives us a reverse interpretation of compositional development from that of Cole's, here relying on an interesting mix of texture upon texture, contrast upon contrast, shape upon shape, to delight the viewer's eye, as opposed to the soft , simple, less detailed subtitles of Cole's muted background. Equally impressive and appealing works in the same medium, but showing the individual strengths of technical style of both artist's mastery of the medium. A triple play of works that maintain a humorous note are next. First Carel Brest van Kempen's, Studio in the City, just screams with jovial content. 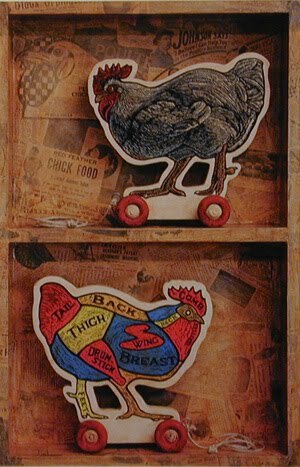 Next, S. V. Medaris', Back in the Day, Poultry Edition, is a delightful assemblage from this second-timer from Wisconsin. And lastly David Milton's, Neon Dove, spoke especially to me as it was very reminiscent of my 2002 included work, Flamingo Motel. All three of these works have that 'tongue-in-cheek' content that naturally brings a smile to one's face. A continuing humorous aspect can be seen in first-timer and Seattle resident, Craig Kosak's, The Third Agreement, in which a pair of ravens hold center stage. His wonderful mix of abstract notions and figurative subject matter, along with mystery once again in wonder at the meaning of it all, certainly attracted my attention and obviously, the jury as well. 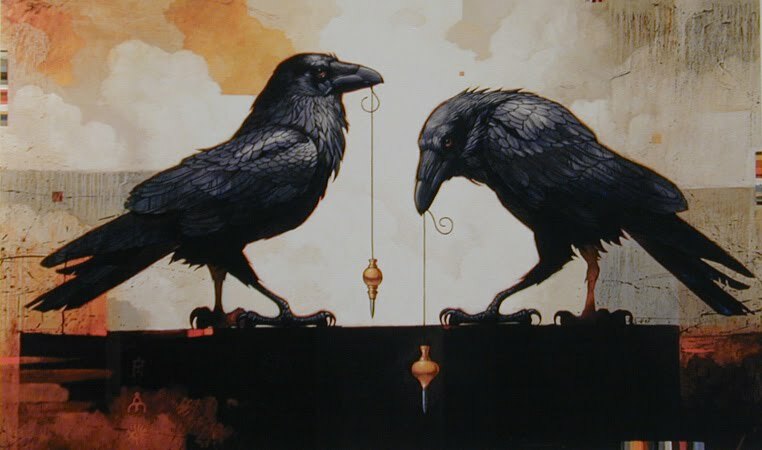 Sometimes, it may not necessarily be what is said or depicted in a work for a thematic jury such as that for Birds in Art, but what is not said, that is capable of capturing the eye of the jury and assuring a spot in the final cut. Two fine and wonderful examples of this possibility are shown here in another first-timer, Darcie Copeland's, Nest Egg, and first-timer Julie Bender's unique pyrographic Ready and Waiting. In Copeland's lush oil, no bird exists as such, but there certainly is the connection with 'bird art'. Her humorous approach left me thinking, 'now why didn't I think of that?' The uniqueness of Julie's medium, wood burning, alone, sets her work substantially apart from all the rest. But, not relying solely on that aspect of her submittal, she has defined a lovely work, again not even showing a bird but deftly indicating the presence of the subject matter of the exhibition not only with humor but with great personality! Sometimes, it may be a strong, unique, graphically unexpected way of using color that can capture a juror's eye, as in the next works. These next two first-timers, Debbie Stevens from Texas and Peter Slater of Queensland, Australia, have brought an intensity to their works that strikes a strong chord in a viewer's eye, yet supports and strengthens the primacy of their subjects. In Debbie's beautiful red-crowned cranes, the birds glide through a lushly intense reflective pool. Color abounds. Movement abounds. 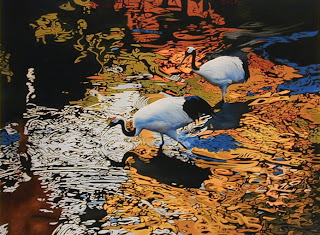 Intricate patterns of reflection give great graphic quality to the work yet remain secondary to the cranes. 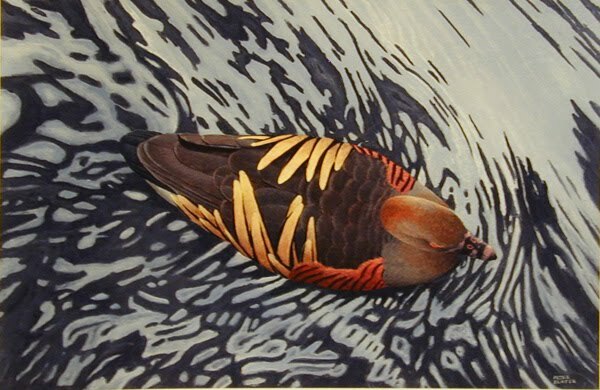 Likewise in Peter's work there is a similar feel, though the color is not as intense and the viewpoint is different, there is a rich connection to Debbie's work in that there are again, nice, graphic delineations of water and movement which are beautifully 'remembered' in the pattern on the back of the Plumed Whistling Duck. In the work above, Julie Rogers has exemplified perfectly what I often speak of when I say that it can be the gesture that gets you. Here, her snowy egrets Clash in the Colony. They bring great movement to her oil painting, generate a lot of interest and demand that the viewer take note to experience all the action and activity that is going on. Many static posed subjects can make beautiful images when other elements and ideas of composition are adhered to. But in this case, the interplay of the three birds against a rather simple yet finely delineated background is what is important about this work, in addition to the masterful grasp of the medium. Timothy David Mayhew, yet one more first-timer from New Mexico, makes use of the same idea as in the last discussed work by portraying a very beautiful, intimate gestural movement with his trumpeter swan work, The Big Chill. It is again, a rather simple straight forward work, minimal background, minimal color. Yet by focusing on the movement of the bird and the interesting twist and curve of its head and the outstretched leg, what might otherwise have been a quite acceptable bird portrait, has turned into something that much more special by taking the time to compose and add interest through an unexpected pose. David Lowther, a Brit and yet one more first-timer (I assure you I did not intentionally select a majority of first time artists to Birds in Art when pulling this together! 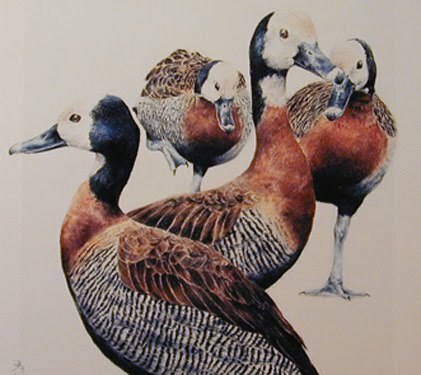 ), has assembled a very interesting composition of white-faced whistling ducks in his lovely pastel work. Now, those of you who have paid attention over the years will recall that I often harp on my desire to work with odd numbers or pairs when composing ideas for a work. David, though working with only four subjects, has defined a very pleasing, well balanced, interesting composition here. What appeals to me about this work most is the beautiful way in which the birds overlap and form a wonderful, abstract shape in themselves. Set on a solid negative background, the large mass of the four intertwined birds makes for a very eye catching work. This beautiful texturally detailed work, above, by Spaniard, Manuel Diaz Galeote, is another piece that caught my particular attention as it also embodies much of what I try to bring to my compositions and ways of describing in interesting fashion, my chosen subject matter. 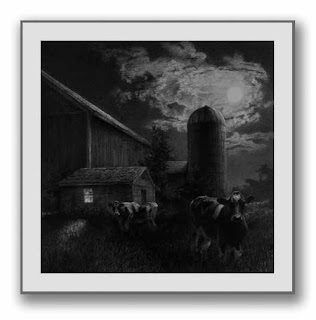 I love the play of textures and simple, monochromatic appearance of this work. And as discussed when all this exploration began quite a few paragraphs ago, his placement of the bird right upon one of the four intersections of the rule of third splits, is so perfect. Added interest is achieved through the unique angle of view, allowing the artist to make use of wonderful angles and diverging lines throughout the composition. Even though the work has an overall tonally similar quality to it, the various textures introduced add the needed interest level. New Hampshire pastel artist, Cindy House starts a look at the final four works with her incredibly beautiful, Reflections, A Touch of Blue. When I talk about holding mastery of your medium, no one defines that better than Cindy. Her landscapes always sing with pure understanding of what she has chosen to focus on. Watching her demonstration of her technique and how she works this past weekend at the opening of the exhibition, was a joy. Her deft strokes with the pastel stick left no doubt that she has complete control of her medium. And the end results are always so captivating, her work just does not fail to draw you in. And then too, another case of 'now you see it, now you don't'. There is a blue jay in the work, but that is not really what this piece is all about and obviously, again, not of primary concern to the jurors. The overriding mastery of medium and understanding of appealing, well balanced composition is what this work is all about. 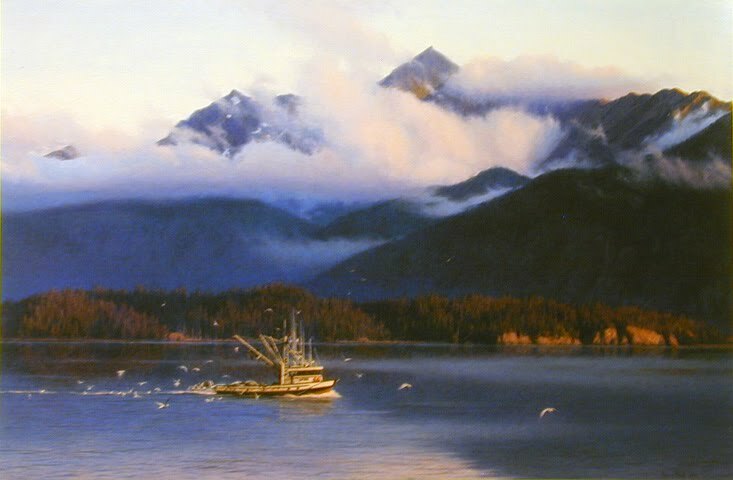 Al Barnes, another Texan, duplicates much of what Cindy has brought to her work in his Lily Grebe, a large 30 x 40 oil painting that just sings with atmosphere. 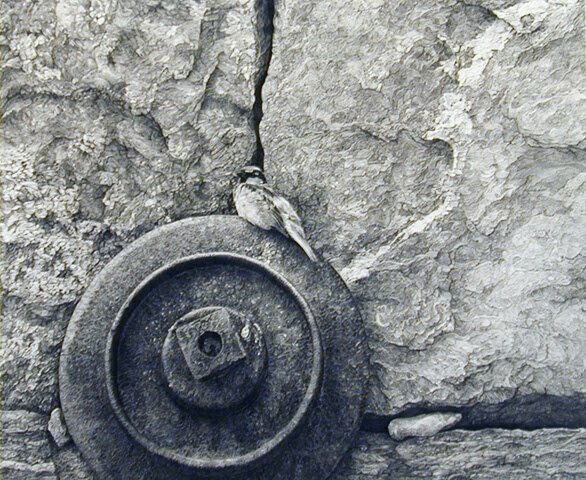 Another work that relies upon a true mastery of medium and compositional structure, his bird, like Cindy's, plays a pretty much secondary roll to the glory of the landscape at hand. A lot of young or just-starting-out artists believe, in relation to submittals to a thematic jury like that for Birds in Art, that they must portray a bird larger than life to prove that they know the intention of the exhibition when in fact, as well shown through these images, the bird can sometimes not even be there or play such a small and almost unnoticed roll. 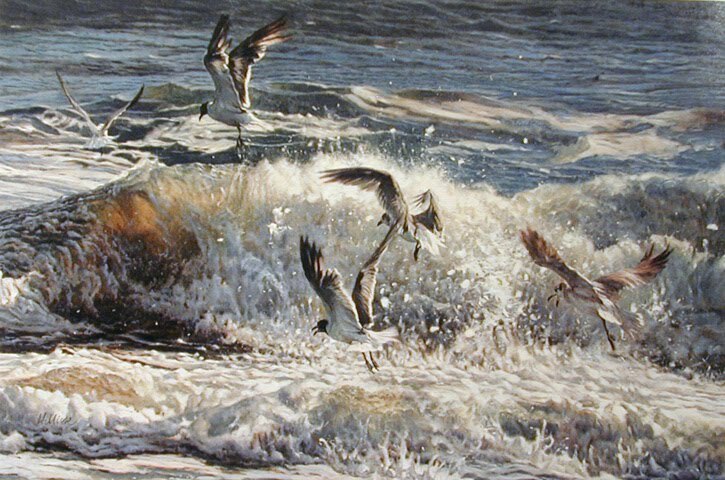 In this next magical and masterful work, Matthew Hillier not only gives us a gorgeous and lush seascape full of movement and interest and substantial development, but places his bird subjects right out front, interacting with their environment as natural as can be. 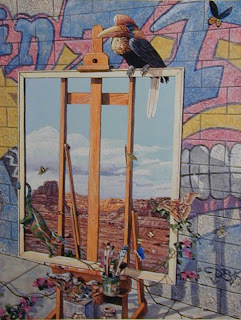 This is a bird painting. But, it also is so much more. It is the kind of work that allows you to lose yourself in it, if you wish. It is the kind of work that grabs hold of you upon viewing and the longer you stand before it, the more you are involved. I can not imagine a juror not being stopped in his tracks by this work when seen in a continuous stream of works being flashed across a screen. And finally, another gorgeously brushed work by the 2005 Master Wildlife Artist at Birds in Art, Vermonter Nancy Howe. In Returning Home, all of Nancy's skills and talents as the superb artist that she is, come to the fore. Though once again, the birds seem to play a very subordinate roll in the overall composition, without their implied movement, the work would be a fine painting but would not, to my way of thinking, have that extra intrigue and feel that it does. What stands out most about this work to me is the typical Howe soft and sublime brushwork. Detail is there, but deftly softened, melting from one luscious color into another. Hard edges do define separations between the elements, yet everything takes on a feel of seeing the world through a fine lace curtain. It is no wonder she was honored with the Master status five years ago. And so, to conclude this look at some of what I think helped to make this year's Birds in Art exhibition a stunning assemblage of art works from artists all across the globe, once again I direct you to take into consideration some of what has been discussed here today when you next tackle a submittal for a juried competition. Yes, what has gone on here has revolved around a very specific, thematic group of works. But, I am convinced that the elements of design and compositional structures that have been talked about her and in years past, can easily be applied to any genre of art. Balance in composition, whether it be in the form of figurative work or abstraction, always is the strongest basis for a good work of art. Choosing the right placement for your subjects and adhering to a few, time-tested and well established norms, can be the difference between a lovely painting or drawing, and a fine, jury-accepted work of art. Incorporating humor, unique viewpoints, unexpected elements, interesting gestures and the like, all can go a long way in separating your work from that of all the other good, technically proficient artists who are competing for the same small number of 'final cut' slots. If it's the second weekend in September, it must be the opening of Birds in Art! And, indeed it was. I am just back from the festive weekend events in north central Wisconsin at the Woodson Art Museum. As I generally have been doing for the last half dozen or more years, since this blog began, I will be posting some images of the exhibition and individual favorite works in the next day or two. For today, I wanted to post this little fellow, one of my two little 'post card' sized works that were donated to the museum's first time event this year. They had asked for donations from the exhibiting artists as a means of raising funds for the museum acquisition coffers and the event was a smashing success all around. 92 post cards were donated, with many artists submitting two or more each. I myself was fortunate enough to have picked up a lovely little gem done by Andrea Rich. All of the cards were push pinned to a bulletin board and artists were not identified on the face of each card, their identity only known ultimately by the purchaser through signatures on the back, and one at a time people were let into the room to have one minute to point to their favorite work and then, after payment . . . woosh . . . out the door and ready for the next in line. The line formed very early and with great anticipation and excitement in the air, it all began and seemed to be over in a relatively short time, the cards just flying off the wall! 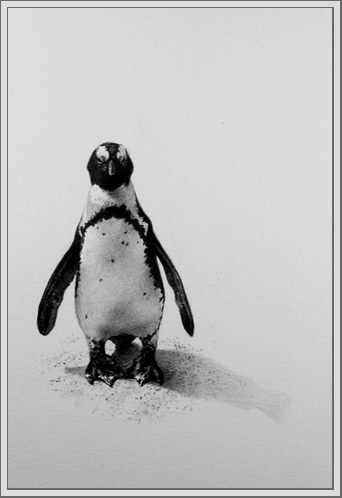 One of the other exhibiting artists chose this little guy and I was thrilled to have a fellow artist become its owner. Now, it's time to get back to studio reality and dig into the body of work that needs to be done for fall showings. I will hope to be posting the weekend review tomorrow or, at the latest, the day after. Check back to see some fabulous bird art! 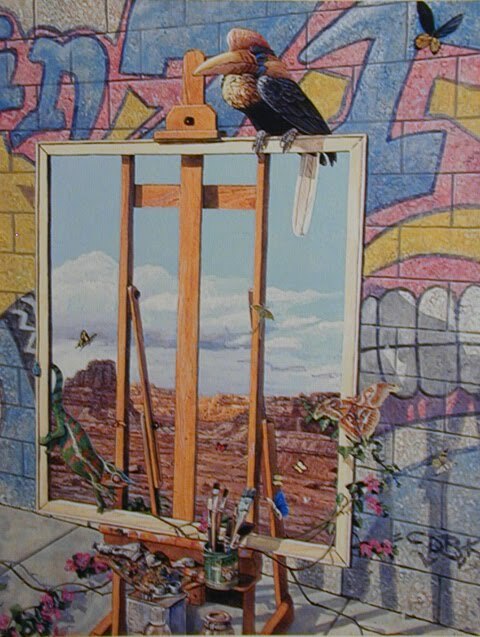 OK, yes there definitely was a connection between my little donation work, above, and my Birds in Art included work, Puttin' On the Ritz, shown here. I thought it would be fun to see if anyone could make the connection between my work hanging in the galleries and the little post card downstairs at the museum. I do believe that 'connection' was made. Part of the joy of being an artist! (Posting at 4 PM) And yes, I am back at the drawing board today, so much to do, so little time. Here is what is going on with the current work that was started last week before I headed out to the midwest. Getting dark out there! Here goes another venture into the night. This time, a little closer to home for inspiration. I wonder how many more night ideas might be floating around in the back of my mind? I'll have to sleep on that. Surprisingly, considering all the graphite piled onto this one, it went pretty fast, it being just a tad over 5" square. It's the second time I've attempted a night scene and I am rather pleased with the outcome, so much so that I have sketched out several more ideas for night works and who knows, the very next piece on the board could be one of them. In the meantime, I'm still going through several hundred shots of gulls and sand and surf! Is it really true - September already? Only two and a half months till the Waterfowl Festival in mid November. Best get crackin'. (11:30 AM addendum) - Yes, it's been pointed out to me that yet again, here is another composition worked within a square. Well, when you have a dozen or fifteen square frames sitting in inventory, they have to be filled! Yesterday was a day away. A run north to the William Ris Gallery in Stone Harbor, New Jersey to retrieve work, drop off new work and to spend a wonderful, though toasty, afternoon in Cape May. Returning to Maryland by way of the Cape May/Lewes Ferry was a perfect, most enjoyable and reference rich hour and a half crossing. Gulls galore, though my reference files are already overflowing. But, you can never have too much reference material!